Years before cornstarch was marketed for culinary use, housewives baked it into weirdly industrial cakes. If any cake baked from scratch ever looked like the product of food industry marketing, it’s the cornstarch cake, a plain white cake in which a third or more of the flour is replaced by cornstarch. It seems so obviously a gimmick to get you to use up that ancient box of cornstarch in your pantry—it’s not just for pudding anymore! You might expect to find such a recipe sponsored by the Cornstarch Council, or perhaps in an ad for Argo brand. What’s more, I have never baked anything from scratch that so strongly resembled, in flavor, appearance, and texture, a packaged snack cake. But cornstarch cake was neither factory made nor even factory invented. 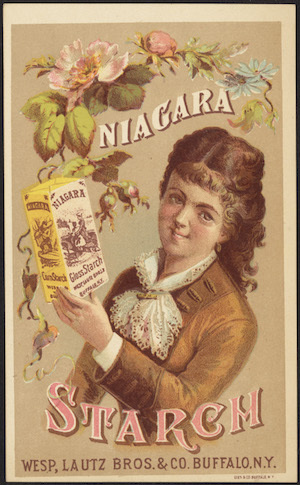 It appeared in the 1850s, decades before cornstarch was branded and sold in boxes and before manufacturers marketed their products with recipes and cookbooks. Cornstarch cake was the product of ordinary women experimenting at home, looking for shortcuts—hacking their cakes, you might say — and that fact ought to make us rethink some of our assumptions about why Americans started eating “processed” food.